Amsterdam kampt met een hardnekkig tekort aan fietsenrekken. Fietsprofessor Marco te Brömmelstroet voert echter aan dat dit een kwestie is van keuzes maken: op de plek van vier geparkeerde auto’s kan je makkelijk 30 fietsenrekken kwijt. Amsterdam is een compacte stad waar ruimte schaars is. Een belangrijk doel van het gemeentebestuur is om meer ruimte te creëren voor voetgangers en fietsers, maar ook voor openbaar groen. Toevallig heeft Amsterdam onlangs open data gepubliceerd over parkeervakken voor straatparkeren. De gegevens bevestigen wat we eigenlijk al wisten: parkeerplaatsen nemen enorm veel publieke ruimte in beslag. De straten van Amsterdam zijn bezaaid met maar liefst 265.225 parkeervakken. Als je de parkeerplaatsen met een bord (oplaadplekken, autodaten, etcetera) buiten beschouwing laat, dan zijn het er nog altijd 260.834. Als je aanneemt dat elke parkeerplek ruimte zou kunnen bieden aan zeker 8 fietsen, dan is er ruimte voor 2,1 miljoen extra fietsenrekken. Natuurlijk ga je niet alle parkeervakken verwijderen en volbouwen met fietsenrekken, maar het illustreert de keuzeruimte die er is bij de inrichting van de openbare ruimte. Amsterdam has a persistent shortage of bicycle racks. Bicycle professor Marco te Brömmelstroet argues that this is really a matter of making choices: the space occupied by four parked cars could easily accommodate 30 bicycle racks. Amsterdam is a compact city where space is limited. An important goal of the city administration is to create more room for pedestrians and cyclists, but also for green areas. 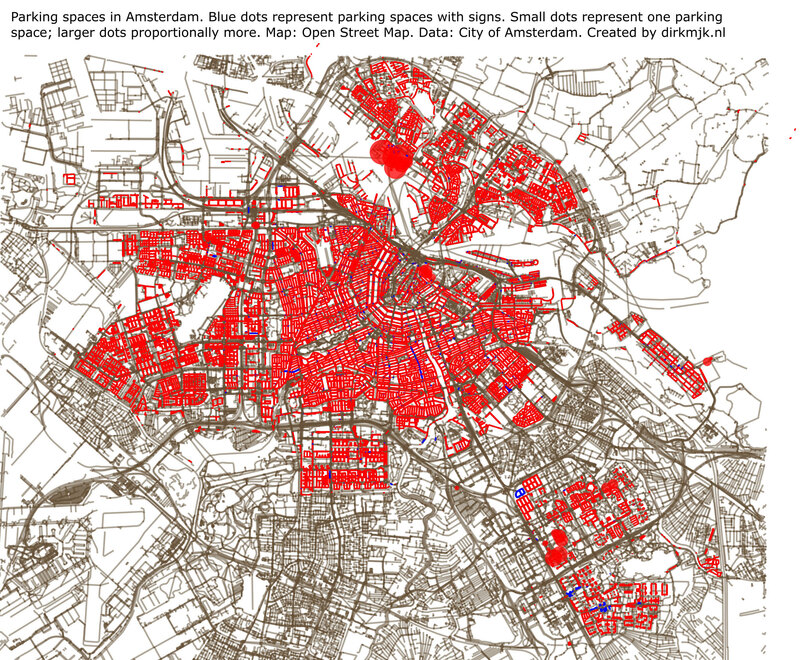 It so happens that the city of Amsterdam has recently published open data on on-street parking spaces. The data confirms what we already knew: parking spaces for cars occupy a huge amount of public space. The streets of Amsterdam are littered with as many as 265,225 parking spaces. If you exclude the ones with signs (spaces for charging car batteries; car sharing; etcetera), there are still 260,834 of them. Assuming that each of them could accomodate at least 8 bicycle racks, there’s room for another 2.1 million bicycle racks. Now you probably wouldn’t want to remove all parking spaces and replace them with bicycle racks, but it does illustrate some of the choices that are available regarding the use of public space. The open data on on-street parking spaces is available in WFS format which is meant for creating maps but can also be used for downloading data - here’s a Python script that will do the job. I set the location of the parking spaces to the centre of the surrounding envelope. I would have liked to display the data on an interactive map using Leaflet and D3js, but I’m afraid the quarter million data points would crash the browser. Instead I used OSM map data in combination with Qgis to display the parking spaces. Unfortunately, this means you can’t zoom in. As for the parking space to bicycle rack ratio: I’m assuming a typical parking space takes up 12 to 14 m2. Cyclists’ organisation Fietsersbond has calculated that regular bicycle racks take up between 0.84 and 1.18 m2 per bicycle. The city of Amsterdam is a bit more conservative and estimates that a bicycle rack takes up about 1.5 m2, including the room needed to remove the bicycle. This suggests that the number of bicycle racks that could be created per parking space lies somewhere between 8 and 9.3. Update 3 July 2016 - The city of Nijmegen reckons it can fit as many as 10 bicycle racks on a parking space. Update 31 January 2017 - And the city of New York needs about nine parking spaces to accomodate 69 city bikes. And a follow-up (in Dutch). How transparent are countries when it regards company data? Score of the Netherlands on Open Corporates’ Open Company Data Index, compared to other EU countries. Ordered by score and alphabetically on English name. Source Open Corporates, chart dirkmjk.nl. Soria was discovered in the Panama Papers, but denied any connection to the Bahamas company referenced in them. It turns out that a company of the same name, UK Lines Limited, had been incorporated in the UK, with officerships linked to him and his family. Further investigation into this company and another UK one, Oceanic Lines Limited, used company filings and shareholder documents to show that these were indeed connected with Soria and his family. Yesterday, newspaper El Mundo nailed the case showing Soria was also director of a Jersey company when he was already a politician. Information about the UK connection was obtained from Open Corporates. Journalists in other countries - from Nigeria to Argentina - have similarly used data from Open Corporates to make sense of the Panama Papers. The information they used may well have been available from official databases as well. However, the fact that countries like the UK have opened up company data, and that Open Corporates serves as a portal to such information, makes it much easier to investigate abuses compared to a situation in which you have to buy each document you want to take a look at. you can’t even search to see if a company exists without giving your credit card, and they have been adamant that they will not open up the register, still less make it available as open data. This earns Spain a score of 0/100 on the Open Company Data Index, which is even worse than the embarrassingly low score of 20/100 for the Netherlands. The good news here is that the Dutch Lower House has passed a motion asking the government to see whether it can open up the company register (KvK) as open data, and to report to Parliament this spring.